Developments in Syria and Iraq are in an dynamic phase where day to day developments can distract from the assessment of probable midi- to long-term developments. Operand factors in this assessment are Russian – Turkish relations, a redirection of Russian Middle East policy, the accord on Iran’s nuclear energy program, the Kurdish discourse, and long-term US strategy with regard to the wider Middle East. The Syrian government’s control over the nation has suffered substantial setbacks since early 2015. The recent establishment of a safe zone in northern Syria – equivalent to a no-fly-zone – in Syria along the Turkish border has challenged Damascus’ capability to provide air support for ground operations against insurgents of the Islamic State, Al-Nusrah and other insurgents. US-led air-strikes against Islamic State are largely displacing ISIS towards Damascus and Baghdad. US and Turkish air-strikes in Syria have provided a safe-haven for the separatist Kurdish YPG. Predominantly Turkish air-strikes against militants of the Kurdistan Workers Party (PKK) in Iraq, on the other hand, are keeping vital supply routes for the Islamic State open while PKK fighters are dislodged and have to seek strategic depth in the predominantly Kurdish north – northwest of Syria. 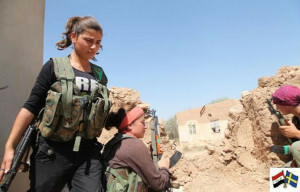 Along with the United States and Turkey’s policies with regard to Kurdish autonomy and the eventual establishment of a Kurdish State in Northern Iraq, these policies and strategies are largely consistent with long-established plans to create a Kurdish federation of a Kurdish State with breathing straw access to the Mediterranean. Considering that the various Kurdish parties and paramilitary organizations don’t have converging policies, strategies, aims, and for that sake regional and international allies, the establishment of a Kurdish construct, whether as a federation or as a State will be lasting for anything between 5 – 25 years. The establishment of a Kurdish dominated region that includes northern Iraq and northern Syria is well underway. US policy aims at expanding this development into northern Iran. The Kurdish people are, arguably, the world’s largest ethnicity or people without a nation. International law provides the right to self-determination. This principle of the right to self-determination is conflicting with the equally valid principle of a nation’s right to territorial integrity. Both principles are lacking enforcement mechanism that are based in coherent law. Currently any enforcement of these principles would either have to be based on one actor, usually supported by one of the superpowers, to establish a de-facto situation, or by a unanimous vote of the UN Security Council. Both situations are equally problematic and questionable and based on policy and power rather than in law. The situation about the establishment of a Kurdish State is being further complicated by Turkey’s support of Syrian and Iraqi Kurds while Turkey is careful not to include Turkish territories in a future Kurdish construct. That situation may change if the pro-Kurdish parties in Turkey gain additional momentum while nationalists continue to suffer election losses. Ironically, a potential breakup of the Turkish Republic, a NATO member, poses a potential threat to Russia. Damascus is increasingly having difficulties to assert sovereignty over the region along the Lebanese border, the Golan Heights and at its border to Jordan. Israel has, by supporting Jabhat Al-Nusrah and associated brigades via the Golan Heights and the Sheeba farm area achieved two major objectives. It has weakened Damascus, but it has also weakened Hezbollah and Hezbollah’s capacity to resist against Israel. Israel has, by implication, weakened Teheran’s sphere of influence. Long-term Israeli policy aims at the permanent annexation of the Golan Heights and the Sheeba Farm area. Weakening Damascus and Hezbollah was one of the main stumbling stones Israel is about to have overcome. Considering the strength of the Israeli military, it will have no problems with dislodging Al-Nusrah and others from the Golan once that becomes opportune. This move would ultimately further weaken Damascus and Hezbollah. Syria has long been Moscow’s primary ally in the Middle East. The naval base in Tartous was Moscow’s sole Mediterranean naval base. Russian policy and strategy had, however, to adjust to the developments in Ukraine and Syria. Moscow was, in other words, confronted with the problem how to secure its export of gas to Europe via Ukraine while searching for alternatives. It is here that Turkey is playing a key role. Even though it is possible to compartmentalize energy policy and geopolitics, this option is inherently risky. The more secure option is to combine the two. Developments in Russian – Turkish relations suggest that Turkey and Russia may be approaching a consensus with regards to both gas pipelines, the Kurdish question as well as the question about at least parts of Kurdish – Syrian territory. Moscow has redirected its naval presence by agreement with Cyprus as well as by attempting to gain leverage via developing and repositioning Russian – Egyptian relations. Also this ultimately suggests that Moscow is thinking in terms of – the inevitable – development of a Kurdish construct and a substantially weakened Syria. An additional, largely ignored factor is that Russia is not dependent on importing energy from the Middle East. The Russian Federation is, to the contrary, aiming at the export of energy. Long-term Russian Middle East policy will have to be based on this consideration. An additional factor in the midi- to long-term considerations pertaining the Middle East is Iran. It is noteworthy that the United States and Russia compartmentalized their otherwise tense relations and cooperated with regard to finding a solution to Iran’s nuclear energy program. Neither the United States nor Russia are interested in an Iran that could develop nuclear weapons capabilities within a relatively short time span; that is 7 – 24 months. Where Washington’s and Moscow’s policies don’t converge is the reason why they share this common goal. All Iranian political posturing for consumption in foreign media set aside, one only has to follow statements by the leadership of the Iranian National Guard in Parsi to understand that the development of nuclear weapons capabilities is boiling underneath the surface of lack-luster diplomacy. The United States, for its part, is aiming at a continuation of a strategy that aims at weakening Iran, starting with diminishing Teheran’s influence as regional player and ultimately aiming at destabilizing at least northern Iran. This policy is consistent with midi- to long-term US goals to establish low-intensity conflicts along the southern border of the Russian Federation, Russia’s CSTO allies as well as along China’s southern borders. Russia, for its part, is acutely aware of the US’ midi- to long term strategic goals. To counter this strategies, Moscow requires a stable Iran, but also an Iran that does not develop its own nuclear capabilities. In other words, Moscow needs Iran for strategic depth and Moscow depends on Iran as a stabilizing force that prevents or at least weakens or delays the spread of Islamist militant organizations along its southern borders. The irony of the situation is that all of the permanent UN Security Council members argue that the current borders in the Middle East are an artifact of colonialism. A divergence between Washington, London, Paris on one hand and Moscow and in part Beijing arises due to the question whether these borders are invulnerable. One could also say that the divergence arises in the discussion about the primacy of the invulnerability of the territorial integrity of nation States vs the right to self-determination. Which ever principle the one or the other nation choses depends – for all of the involved parties – on utility, not on international law. A comparison between 2015 and 2025 maps of the Middle East is likely to be equivalent to comparing a 1980 map of Yugoslavia with a 2015 map of the Balkans. The tragedy is that the UN and the Security Council are failing the nations and the people of the Middle East as much as the League of Nations has failed those Middle Eastern and African nations who would suffer the consequences of two European Wars.